I was at the Miro exhibit at the Seattle Art Museum and was mesmerized by my son's interpretations of his sculptures and paintings. Miro's approach was so simplistic, but my son's explanations were so complex. 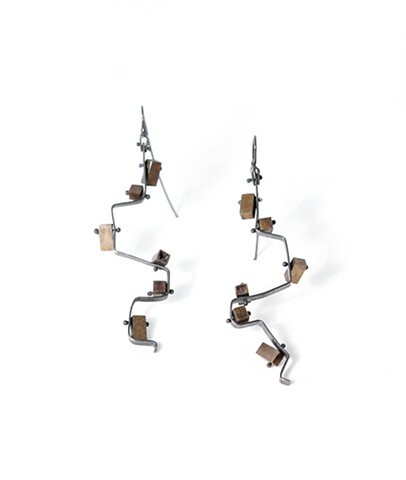 This earring is about the simultaneity of simplicity and complexity. Oxidized silver earring with patinaed brass squares and rectangles, some hollow, some solid held to the base with ball rivets.